I love casseroles. I love them because they are easy, they are usually delicious, and they stand alone. Every true Southern belle has had her share of casseroles at church potluck dinners, and I’ve never heard anyone complain about it. 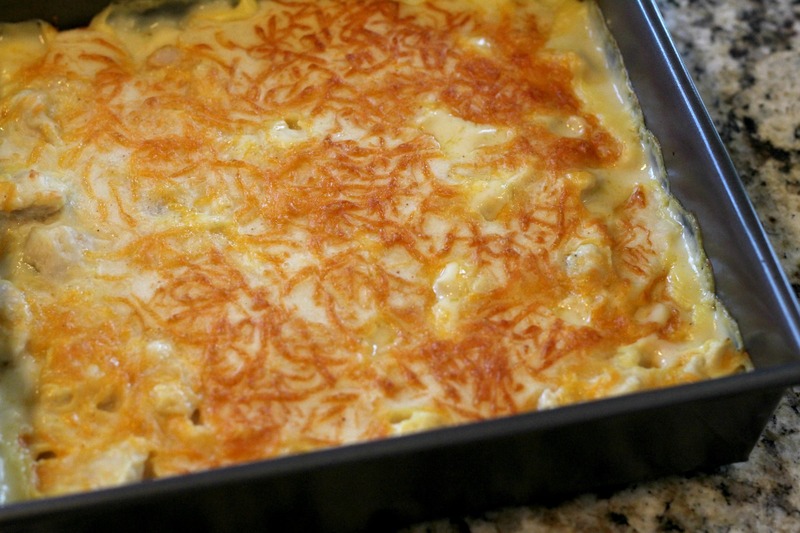 I think casseroles are the perfect “make for someone” dish. Whether someone had a death in the family, or had a baby, or whatever scenario might prompt you to make a meal for someone else’s family…casseroles are the way to go. Anyways, this is a super simple and tasty casserole that is sure to please. It’s especially great for people who don’t like veggies in their casseroles (or at all)…like most kids who’ve ever lived. We definitely liked how this dish tasted, but the texture was a little more “creamy” than I expected. I mean, I know it says creamy in the title, but I almost felt like mine was a bit more “runny”. I wanted to eat all that delicious filling but it wouldn’t stay on my fork! Don’t worry though, tongues were created for licking creamy goodness off of plates. In a large bowl, combine soup, sour cream and 1 c milk; mix well. Stir in chicken, salt & pepper. Pour into a 9x13 baking dish. In a medium bowl, whisk together baking mix, cornmeal, egg and remaining ¾ c milk. Spoon over chicken mixture. Sprinkle with cheese. Bake 30-35 minutes, or until edges are golden and casserole is hot. I grew up in the south and I definitely had my fair share of casseroles! They are easy and relish! When I hear anything like “creamy chicken casserole”, it is the same reaction I have when I hear the words “money”, “shopping”, “hot fudge Ice cream cake”, etc I MUST have it as quickly as possible So, I’m making it right NOW Thanks! Can’t wait to eat it! Haha I can definitely relate! For me it’s anytime I hear of “stuffed” foods Like “stuffed flounder” “stuffed pork chop” etc…I don’t know why but it just gets me! I do like veggies in my casseroles, so I added 1 cup of frozen mixed vegetables to the soup mixture before putting it in the baking dish. It seemed to firm up the soupiness (is that a word?) a little, too. I let the dish cool for about 10 minutes before scooping it on the plate. That firmed it up a bit more. This sounds like a kicked up version of the southern classic Chicken Pie or Pot Pie. … bet its yummy. It is definitely yummy! I also am not a big fan of the veggies in chicken pot pies, so this one is a veggie-free casserole! I live in South Africia and have never heard of Bisquick – could you describe it as I would guess we have something equivalent. Bisquick is pre-mixed baking mix with flour, shortening, baking powder etc. I’m not sure if you have something like that in South Africa. Hope you find something similar! I am going to make this tonight but I think I will add some frozen spinach that has been drained and squeezed dry to the soup mixture. Not only will it be color full but I love spinach and will add just a slightly different taste to it. Thanks for a great recipe. That sounds like a great idea, Micheale! Let us know how it turned out! This is delicious. I am not a big veggie fan either so it is refreshing to find I’m not the only one. I read all the reviews first so I added a little Bisquick to the soup mixture to help it thicken up a bit. It worked great. Thanks Bev! Glad you liked it! Plan on making this for dinner 🙂 but one question, am I reading that right.. 6-8 cups of chicken, just sounded like a lot so wanted to check. Hi Jessi. You’re right, that does seem like a lot! I copied the recipe from eMeals, but I’m guessing it’s a typo. Since I posted this recipe 3 years ago, I can’t quite remember the exact amount I used, but I’d guess maybe 3-4 cups of chicken instead. Just changed it on the recipe. Thanks for catching my mistake! Can this be made ahead and put in the refrigerator? I don’t see why not! I think it would work fine. If you try it out, let us know how it is! I say go for it and let us know how it is! That definitely sounds flavorful! I add a 4 oz jar of chopped pimento to the soup mixture. And, I top the Bisquick mixture with french fried onion before baking. Crazy good! Oh both of those additions sound marvelous! Thanks for sharing! Hi! I subscribe to many recipe sites for new ideas, I would like to let you know that your fill my pages many times over. Just a note of THANKS!!!! Thanks Barb! I’m so glad you’ve found my site to be helpful! Hope you find many more recipes your family loves! If it’s just the taste you don’t like, I promise you won’t be able to taste it in this recipe since it’s such a small amount and there are so many other flavors. I’m not sure of an alternative that would work. Grits can be substituted for cornmeal, but they are more coarse, so you might not like how it affects the texture. You could maybe try corn flour? Can you freeze this casserole? Thanks Mary! I hope you like it! Hi Irene. Semolina flour is a good substitute for corn meal. Hmmm…I’m guessing that would not be a very good substitution. It would change the flavor dramatically and probably the texture too. It might still be good, it would just be very different from the original. If you give it a shot, please let us know how it turns out! We just had this for dinner. I added broccoli and French’s Fried Onions and it was delicious. My husband couldn’t stop eating it! Oh, French Fried Onions make everything better! Shared with my readers and pointed them here for directions. Thanks for the recipe. Thanks Cassie! Hope your readers enjoy the recipe too! This sounds so delish! I’m definitely going to add this to my weekly menu. Loved the tips on adding veggies too. Thanks Ginny! Hope you like it!